Driving a Vehicle? Stay Off That Phone! I was leaving the grocery store and nearly wrecked as I had to slam on the breaks to avoid hitting a car that pulled out directly in front on me. I was looking right at the car and the driver did not look in either direction, she never even glanced at all! What was she doing? She was talking on her cell phone! She came out of that parking lot without looking or even being aware that there was anyone else in the world besides her. I drove on and less than a half a mile on farther down the road another driver, this time a man, made a right hand turn from a red light without stopping. He pulled out in front of us and if the left lane hadn’t been clear we would have had a collision. What was he doing? You may have already guessed that he was talking on a cell phone! A little while later, maybe another mile and a half into our drive, a lady suddenly changed lanes almost right on top of us. I had to hit the brakes and swerve a little over into the median to avoid her. She was going down the 4 lane talking on her cell phone and was completely oblivious to the fact that she had changed lanes! Hang Up That Phone And Drive! Nearly everywhere you look people are on their cell phones. They cant seem to drive down the road, pump gas, shop, or do much of anything else without having that little phone pressed up to the side of their head! I wonder how many deaths and injuries have been caused by these people? More than a few I am sure. Talking on a cell phone while driving is against the law in many states but not in Kentucky. However, it shouldn’t take a law for people to wake up and stop doing this! If you have to make a phone call then pull over somewhere! Better yet if you can’t stay off the phone then stay out of your vehicle or get someone else who has better sense to drive for you. I will not apologize to anyone who is offended by this. It makes me so angry when I see things like this and someone driving a car while trying to text or talk on their cell phone. If that is you then please consider what you are doing before you end up killing yourself or someone else! Texting while driving was recently banned here where we live. I suppose that is a step in the right direction. However, I am generally against the idea that we have to have laws for this sort of thing. Too bad the human beings cant be intelligent and responsible enough to stay off the phone while they are driving. I too see this every day (when I drive) and couldn’t count all the close calls we have had because someone is flying down the freeway yakking on that phone! 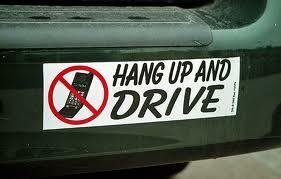 Texting and chatting on the phone while driving is responsible for many deaths and injuries. It just isn’t worth it! I say if you get caught talking and texting on your phone while driving it should be just as serious as drunk driving. Take that idiot’s license!